Don’t use more than 30% coconut oil in a recipe – it will be too drying. Don’t superfat more than about 8% to 10% - the soap will be soft, have poor lather, and will be prone to the dreaded orange spots/spoilage. What happens when you make a batch of soap with 100% coconut oil but increase the superfat percentage to 20%? 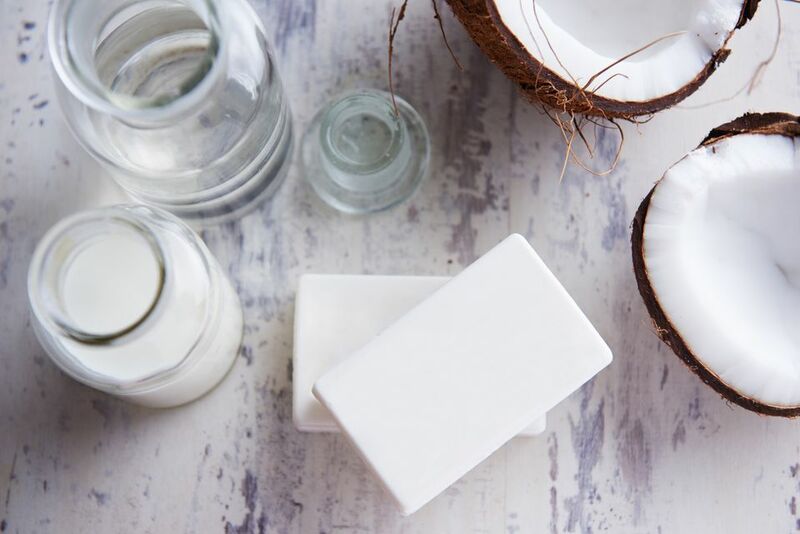 The pros of coconut oil and superfatting combine to cancel out the cons of using a high amount of coconut and using a high superfat percentage - resulting in a really lovely bar of soap! Coconut oil is not really “drying” – it’s just super cleansing. It cleans your skin so well that it strips the oils off of your skin – making it feel dry. Coconut oil itself is good for your skin. Having 20% extra oil in the soap mitigates the "drying" effect - resulting in a bar that's really mild and good for your skin. Dreaded orange spots (or DOS) are caused by the free oils in the soap going rancid. In any bar of soap where there is any amount of superfatting, there is going to be a certain % of oil left behind. In a standard, balanced soap recipe, you’re going to have a combination of soft, more fragile oils like canola, sunflower, almond, or even olive along with long-lasting hard oils like tallow, palm or coconut. Coconut oil is a long lasting stable oil. Even if left “free” in the soap at a high percentage, it’s going to be sturdy and shelf stable for 1 to 2 years. Add to that stability, it makes a super lather and you can see why a 100% coconut oil bar of soap cancels out the lathering and spoilage issues commonly associated with a high superfat percentage. Follow the directions for making a basic batch of soap. This batch, while non-traditional, is predictable and reliable when it comes to soap recipes. When you are calculating your recipe in your lye calculator, just use one oil, coconut, and enter 20% as the superfat. Coconut oil doesn’t trace super quickly, so you can use a 2:1 ratio of water to lye pretty reliably. Make your lye solution first, and set it aside in a safe place. Weigh out your oils and melt them on the stove top or microwave. Make sure all of your additives, color, and/or fragrance are ready to go, with all of the spoons, spatulas, and mold ready to go. Slowly add the lye solution to the oils and blend until it is well mixed. Add in the fragrance or essential oil. Continue blending until it reaches a light trace and add any additional additives. Pour the mixed soap into the mold. This recipe will harden overnight. You'll want to unmold or cut it in about 12 to 18 hours.